Braces are available for a number of different injuries. Bracing has been shown to decrease pain, improve function, reduce swelling, and psychologically provide more confidence in the injured body part. 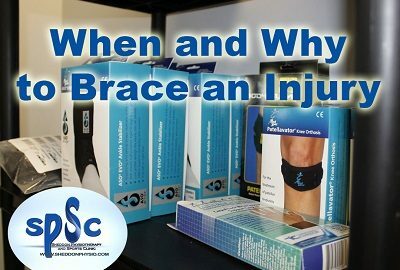 However, how do you know when it would be appropriate to use a brace? Below we will discuss the benefits of bracing and address some common questions about using a brace. There is some research which has examined whether bracing a non-injured joint will prevent injuries. Studies have looked mainly at knee and ankle bracing in sports such as soccer and football in order to shed light on whether or not it helps prevent injuries such as ACL, MCL and lateral ankle sprains. Overall, the evidence is controversial, with studies suggesting that it may only be effective in certain positions in football, while being most effective for individuals with prior injuries. Will a brace make my muscles lazy and weak? Studies have shown that long-term use of a brace has no negative effect on muscle strength, function or proprioception. A recent study examined the use of wearing a knee brace for 7 hours daily over a 6-12 week period, and actually found an increase in quadriceps strength and decreased muscle inhibition after the 6 week period (Callaghan et al., 2016). Will a brace hinder my performance? As long as the brace fits properly and isn’t too bulky, it shouldn’t have a negative impact on sport performance. Research has shown ankle and knee braces do not impede vertical jump, speed tasks or dynamic balance. However, studies do mention a “break in” period, lasting roughly 3 days, in which initially athletes will have a decrease in performance as they get used to the brace. Is it worth the extra money to get a custom brace? If an off-the-shelf brace doesn’t fit properly, then your best option is a custom brace. A brace that is too tight or too loose won’t be able to work properly. Most braces are covered under extended health care plans. In most cases, in order for an insurance company to cover the cost of the brace, you will need a doctor’s note stating that the brace is for daily wear (a brace intended just for sport, may not be covered). The staff at Sheddon is knowledgeable in different bracing options and since we carry a large selection of different brands and styles, we can better determine which brace would best suit your needs. If you have any questions about bracing, please ask your Sheddon Therapist for more information. Callaghan et al., (2016). The effect of knee braces on quadriceps strength and inhibition in subjects with patellofemoral osteoarthritis. Journal of Orthopaedic & Sports Physical Therapy. Margarita et al., (2010). A systematic review on the effectiveness of external ankle supports in the prevention of inversion ankle sprains among elite and recreational players. Journal of Science and Medicine in Sport. Raja et al., (2010). Efficacy of knee braces and foot orthoses in conservative management of knee osteoarthritis: A systematic review. American Journal of Physical Medicine and Rehabilitation.